I am on the road again friends. I will be out all week. I thought I'd leave you with the image of the mini Cheerio quilt I finished piecing and almost have finished hand quilting. It is about the size of a placemat and it's for a swap I'm doing. 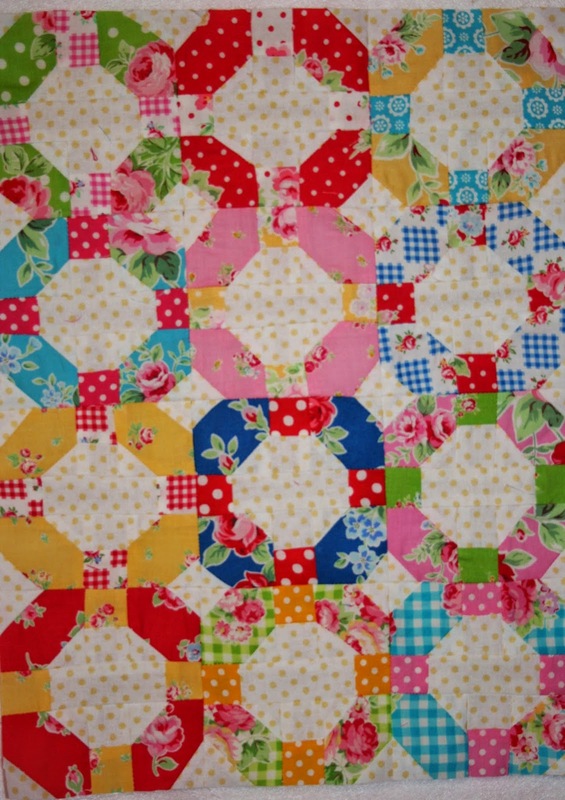 The pattern is by Camille Roskelley and the fabric is Flower Sugar by Lecien. The background fabric I had in my stash and don't recall what that is. I'm quilting it with yellow pearle cotton. Have a blessed week! Be back soon! Such pretty colors and patterns! What a sweet little quilt. I have a few small quilt tops completed that would be fun to had quilt. The fabrics you used are beautiful.